The beginner’s guide is a series of articles specifically for exhibition virgins. Its aim is to help people avoid common mistakes and to understand the basic principles of exhibiting at a trade show for the first time. We recognise that the road to a successful exhibition winds through active minefields, precarious mountain passes and often hits unwanted roadblocks and diversions. One minute, you’re on newly laid tarmac, the next you’ve hit a gaping pothole. To navigate the treachery of this metaphor, you’ll need a suitably robust vehicle and a decent roadmap. You’ll also need patience, motivation and the ability to keep your eyes on the prize. In this first article, we’re covering areas of preparation that you’ll need to do yourself before approaching an exhibition supplier like Rounded Edge Studio. There is no ‘one size fits all’ approach to exhibiting; hopefully that will become clear throughout this series. 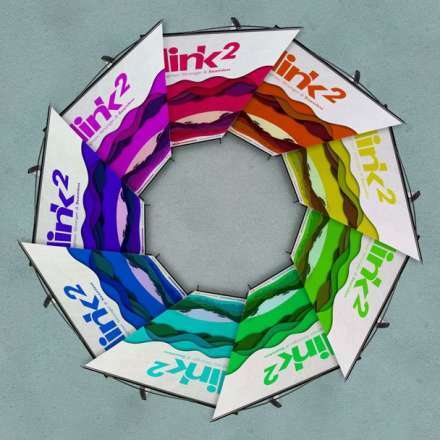 With exhibiting, as with most marketing ventures, an important place to start is the end. If you cannot answer the question ‘what are the desired outcomes from the show?’ (or more generally, ‘why are we doing this?’), you’re effectively blindfolding yourself. Vision is not everyone’s thing, but it’s very useful here. It’s essential to decide your goals for the show at the start of the planning process because they affect every decision made thereafter. This is a fundamental point which will guide ideas of scope, ambition, budget, feasibility, location within a hall, exhibition stand design, hardware system, size, accessories, staffing (including training, travel and accommodation), engagement activities, venue and even the specific show to attend. It is tempting to imagine ‘the prize’ as a fixed thing, an unshakeable part of your vision. As we’ll see later though, an exhibition project needs to remain fairly fluid at first, and your goals will probably change more than once before the day of the show. Starting at the end means locking all your stakeholders together in a room and not letting them leave or eat biscuits until they’ve agreed on the goals of this project. Phrases like ‘blue sky’ and ‘outside the box’ could rear their ugly heads in this meeting, so your room might need padded walls. And extra bins for collecting spontaneous projectile vomit. Your stakeholders will vary depending on the type of business you have, its size, structure, culture and so on. So guidance here has to be vague, other than to emphasise that vision and ideation are the required skills at this early stage. Had you previously exhibited, this meeting would include learnings from the last show and fine-tuning of the previous goals. But as an exhibition virgin, there’s quite a lot of guesswork to be done here. An exhibition is by definition a showcase for something, so the desired outcomes for the project are about what you hope or expect this specific showcase event will bring to your business. For budgeting purposes, it’s helpful if it’s something quantifiable like an estimated number of new customers, sales leads or products sold on the day of the show. But an exhibition is a networking event, so your goals should also include some more abstract ones; industry exposure or presence, for example, might bring long-term value to your business through brand perception, but it’s much harder to measure (or at least attribute to a specific event). Very much linked with the ability to achieve your project goals is the exhibition stand you create as a vehicle for delivering the showcase. 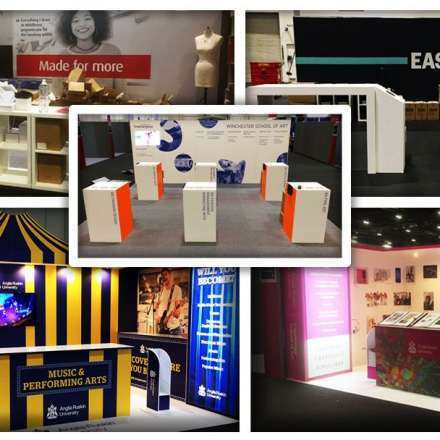 If you need ideas about what your desired outcomes might be for an exhibition stand, we’ve listed a few examples on our Custom Build page. 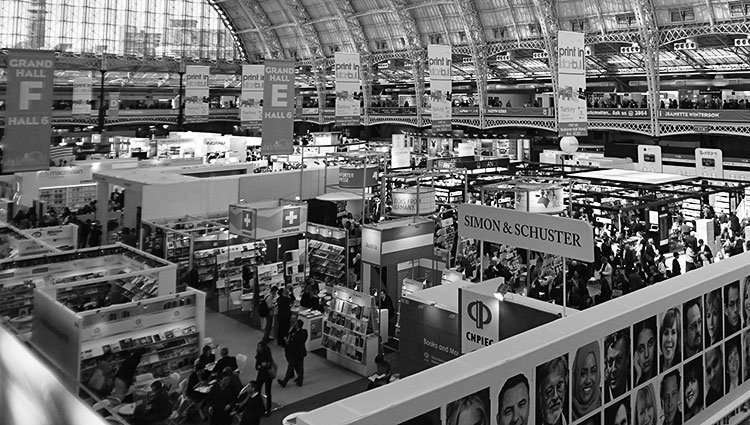 Custom Build is a high-end, fully-bespoke marriage of exhibition products and services, but these outcomes remain key whatever the size and scope of your exhibition stand. No doubt there will be other outcomes you’d like your exhibition stand to achieve, but without knowing your context, it’s impossible to say what they might be. 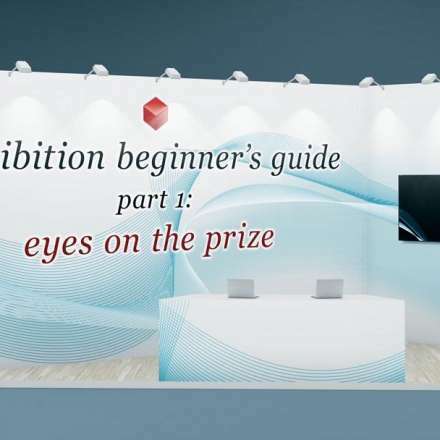 This, as it turns out, is the main difficulty with creating an exhibition beginner’s guide – the variety of companies who might exhibit is huge, the variations in context mind-boggling. The reasons for exhibiting will always be individual to the exhibitor themselves. A deeper awareness of your context should help you to identify and prioritise your desired outcomes for both the project and the stand. What is your marketing initiative? A product? A service? A corporate rebrand? A promotion? What problem does your initiative solve? Do you need to speak to your existing audience or reach a new one (or both)? In what industry or market do you operate and what’s your position within it? What are your competitors doing and what are their market positions? Does your industry hold trade shows? How often? Who attends them? Who exhibits at them? What can be achieved at an exhibition that you couldn’t otherwise? Think about the enormous range of possibilities for just one of these context questions – if your marketing initiative is a product launch, is it a hearing aid? Jumbo jet? Gourmet burger? Subterranean drill? Modular exhibition system? Fridge magnet? Each product type would benefit from a different approach. Some would not be suitable for an exhibition at all. It is not unheard of for brands to exhibit without any marketing initiative at all, just to maintain market visibility or even to outshine a competitor by outspending them. This approach is very expensive because it elicits no direct return. It’s certainly not a good idea for an exhibition virgin. Keep trying to think of your best outcomes and how to achieve them. Eyes on the prize. You’ll probably have noticed that we didn’t ask ‘what is your budget?’ as a context question. That’s because deciding on a budget at the start of the process limits your ability to consider all the desired outcomes. We’re not saying you shouldn’t have a ballpark budget in mind, but an exhibition project could fall at the first hurdle if your budget is fixed. Budget is largely within your control; you can choose to fund your considered risk with investment or borrowing. This may be your first exhibition, but we’re assuming you know how to take business risks. The ROI will vary considerably as changes in budget affect the project’s scope. Each increase in budget potentially provides bigger stand spaces, better locations, better exhibition hardware systems, more staff and so on. But remember the law of diminishing returns; bigger is eventually not better. So although complex, budget can be thought of as a sliding scale within realistic boundaries. Somewhere along that scale is a sweet spot where ROI is maximised. For your first exhibition, it’s probably going to be where a modest budget still leads to good outcomes. The important thing for finding your budget boundaries is to quantify and assign a value to as many of your project’s desired outcomes as possible. For example, knowing each new customer is worth £10,000 to your business, you’ll quibble less over a £1,000 budget increase likely to secure one. Again, eyes on the prize. There’s no doubt that budgeting is a challenge for first time exhibitors, since you have no historical figures to lean on. You’ll likely feel slightly exposed and vulnerable having to make so many estimates. If you have the kind of relationship with a competitor or other similar business whereby you could ask for rough cost and ROI figures, now might be the time to pull in that favour. Contacting an event organiser could help with budgeting for a range of stand spaces and also with estimates of delegate attendance figures, but you’ll have to have an idea what kind of venue and event you’re interested in to make this truly meaningful. Perhaps counter-intuitively, contacting an exhibition supplier for the cost of a stand design and build would probably be quite unhelpful at this point. You’d be asking them to cost hardware, design, print and reprographics, logistics, delivery, install and breakdown, plus extras like literature, lighting, electrics and WiFi. Without any specifics at all, you’ll be lucky to get estimates in the right sport, let alone ballpark. Whilst we don’t recommend trying to use a formula due to the huge number of variables in play, it is possible to take the cost of a stand space and add the same again for your exhibition stand design and build costs. If you have nothing else to go on, it’s a start at least, but you must expect this figure to change later. We think this first part of the exhibition beginner’s guide should include some common budgeting mistakes even though the scope of the project (especially the exhibition stand itself) is not yet well-defined. Think of these as shortcuts; they might help speed up your process of refinement. One common mistake that new exhibitors make is to blow their entire budget on a stand space that’s bigger than they need, in a prime location within the exhibition hall or at an unnecessarily prestigious venue. Then they find they can only afford a couple of roller banners and a trestle table for their display. Or they have a decent enough stand, but can’t afford to staff it properly. This kind of imbalance generally has the opposite effect to that desired; you get plenty of footfall past your stand, but nobody stops to engage. We’ve also seen exhibition stands with no engagement activities. It’s not enough these days to simply be present; there has to be a compelling reason for delegates to visit your stand. Engagement activities should therefore be front and centre of your stand design. They don’t usually require a big chunk of overall budget either, so there’s no excuse for overlooking them. 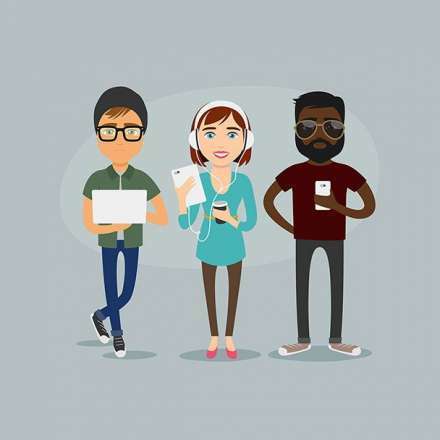 Furthermore, they form a theme around which to build social media campaigns and other marketing activity, so they are much more than just the icing on the cake. Another budgeting mistake is to consider a show in isolation. Many exhibition display systems are at least partly re-usable. Smaller systems like roller banners or portable display systems are entirely re-usable, if installed and taken down with care. That means that some of the initial hardware budget can be amortised across several shows, giving far more opportunity to achieve a good overall ROI. Planning for a single show sticks all your eggs in one basket. A schoolboy error is to try to cut costs by requiring the staff running your stand to do the installation and breakdown themselves. These are likely to be members of your sales team. We’re not saying that salespeople are all incompetent at practical challenges. But they should undoubtedly be focussed on achieving the desired outcomes, not getting a sweat on carrying heavy boxes from the car park and assembling equipment from 6am on the day of the show. Experienced exhibitors know that this is an absolute no-no. Finally, it’s quite common for new exhibitors to plough all their time, energy and money into the show itself without considering the peripheral marketing activities that would have increased its success. With the ‘why?’ question considered in some depth, you can now start thinking more about the ‘how?’ question, which basically boils down to an assessment of the scope of the project. But where to start with this? Our advice is to attend as many exhibitions as possible by way of research. Looking at photos online and brainstorming original ideas could have some contributions to make, but actually attending shows will give you a valuable feel for what’s working, why and how. If you can, attend the actual event you think you’d like to exhibit at next year. You’ll see, among many other things, your own competitors in action and the scope of their ambitions which is useful for benchmarking. You’ll also see what kind of delegates attend the event, which will help determine what your engagement activities need to be. You might even be able to grab a few minutes with the event organisers while you’re there. If you’re currently thinking “Next year!? But our product’s ready to launch in 3 months!”, then you’ve grossly underestimated the timescales involved with exhibiting. A realistic planning, design and development cycle for a big exhibition stand is around 6 months, even if you know what you’re doing. 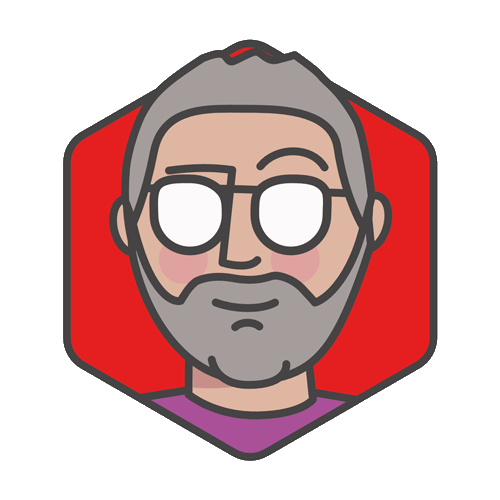 Again, timescales are affected by myriad variables, but if you want to get it right, you should allow a couple of months even for a small, basic stand. But irrespective of this, the event organiser will be trying to book up the hall a year in advance, sometimes more. So if you want a good spot at the show, you should probably start some outline planning 18 months in advance. What’s possible and what looks unfeasible? 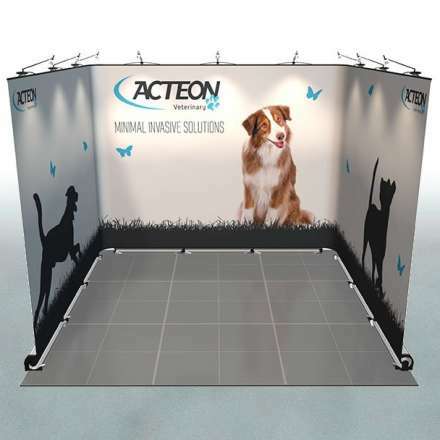 What sort of exhibition stand design works or doesn’t work at various different sizes? Do the stands have seating areas? Meeting points? Refreshments? Presentation areas? What engagement activities seem to be attracting the punters? Which are totally lame? Where’s the footfall strongest and weakest in the hall? Does it change at different times of day? How many staff are on the stands? Is it enough? Are some exhibitors using tech effectively? How? Do the stands have handouts? How are they being distributed? Where are they being stored? The learnings from these exhibition research visits will inform all aspects of the journey to your first show. You’ll see best and worst practices. You’ll get positive ideas you can copy or adapt for your industry, company, product or whatever. Or it might put you off completely; that is also a valid response. From day one of the project, the shape of your eventual exhibition stand is being moulded from a blob of wet clay. As you near the end, the details become increasingly less abstract, and the estimates eventually turn into final figures. But this kind of initial uncertainty can be quite off-putting to an exhibition virgin. Seasoned exhibitors don’t like it either, but at least they have experience of the process. The research you’ve done at exhibition events should cause you to revisit your original ideas as the scope and feasibility of your vision becomes clearer. In other words, through a process of learning and refinement, almost every aspect of your vision could change to some extent (including your understanding of what your desired outcomes should be). That means there is a certain fluidity required in the planning of an exhibition project. You may even have to accept that ‘eyes on the prize’ is a relative term; that the prize itself might be a slightly slippery kipper. However, it’s worth reiterating that having your desired outcomes outlined, refined and prioritised at this stage is a strong driver of direction which gives you both purpose and the confidence to see the project through. You should feel like you’ve answered the ‘why?’ question now. 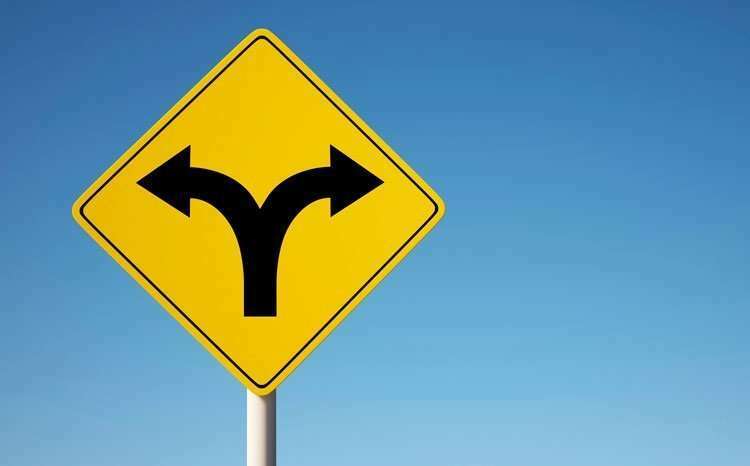 On top of refinements you decide to make during your journey, you’ll also have unwanted changes thrust upon you. You might find the charismatic expert speaker you booked has died in a tragic gardening accident, for example. That would prompt a full reassessment of your outcomes, because you might have to shift to a different engagement activity. Surprise revisions aren’t always a bad thing though. When you later come to look at the various exhibition products (hardware systems) and services available within your budget, it might turn out that you can be more ambitious than you initially expected. Or maybe you stumble upon a hugely engaging way to use a small stand space, saving you money on staff, hardware and the space itself. If every shift in scope and direction necessitates a detailed revision of your ROI estimates and budget, you’ll find yourself in Excel Hell; a kind of spreadsheet revisionist’s Groundhog Day. And nobody wants that. So try to revise your estimates only when it feels like a fairly major shift just happened. 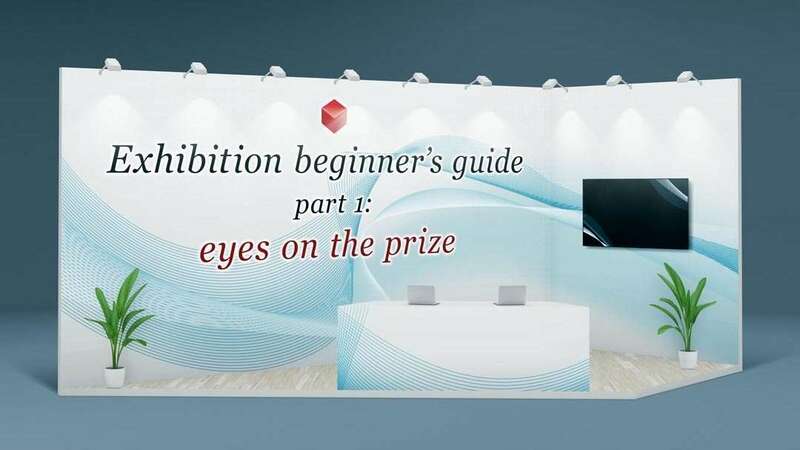 At this point, you’re nearly ready to approach exhibition suppliers with your vision, your ideas, an outline of your requirements and a better grasp of timescales. We’ve talked about the benefits of exhibition supplier partnership here. Whoever you choose, you’ll be able to work through the possible exhibition hardware systems that fit your budget boundaries and start thinking about exhibition stand design. A good supplier will listen carefully to your requirements and enter into a deep dialogue regarding the best way to achieve your desired outcomes, understanding your brand and your marketing initiative. So not knowing what those goals are at this stage would put you at a distinct disadvantage. Exhibition suppliers can transform your vision into reality, but they are not known for performing magic tricks. Start at the end: ask why you’re doing this. Specify your desired outcomes for the exhibition project. Consider your desired outcomes for the exhibition stand. Refine these outcomes by considering the context of your marketing initiative, business, industry. Estimate the cost and ROI of as many variables and desired outcomes as possible. Map out a budget range and estimate roughly where your ROI will be maximised. Attend exhibitions for research. Try to attend the show at which you intend to exhibit. Use realistic timescales. Discover how and when the event organiser books space in the hall. Incorporate learnings from your research into your project; revise your goals, plans and budgets accordingly. You are now almost ready to approach an exhibition supplier. Part 2 of this guide will hopefully get you brief-ready. In the next article in the exhibition beginner’s guide series, we’ll be looking at scope, hardware systems and stand design considerations.